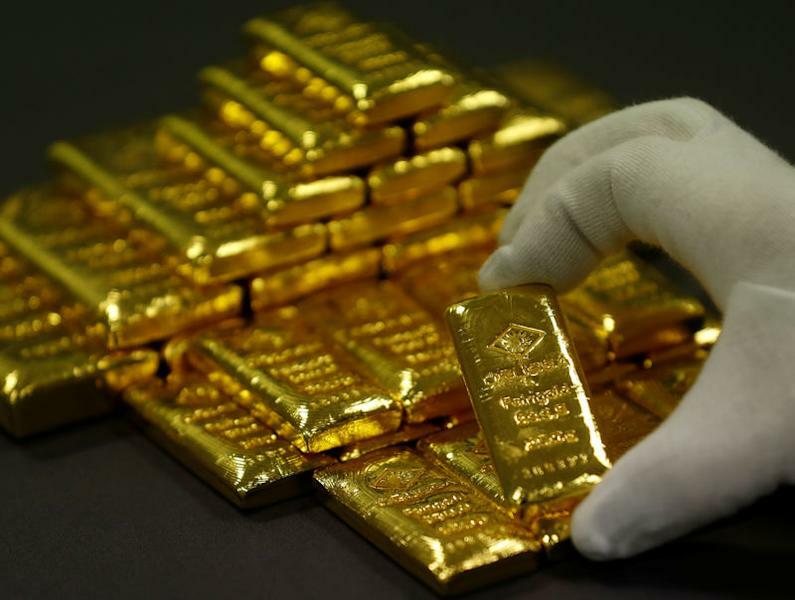 NEW YORK/LONDON (Reuters) - Gold edged up to hit its highest in nearly a week on Thursday as the U.S. dollar slumped, its safe-haven appeal lessened by reduced fears over the near-term impact of Sino-U.S. trade tensions. The dollar hit a nine-week low against a basket of major currencies, while world stocks bounced up amid continued relief that fresh U.S. and Chinese tariffs on reciprocal imports were less harsh than originally feared. Spot gold gained 0.2 percent at $1,205.89 per ounce by 1:36 p.m. EST (1736 GMT), having hit its highest since last Friday at $1,028.31. U.S. gold futures for December delivery settled up $3, or 0.3 percent, at $1,211.30 per ounce. "America is killing itself with these trade tariffs. (They) actually hit America far harder than (they) hit China. The idea that the dollar is all mighty and going to continue to rise is not true," said Alasdair Macleod, head of research at GoldMoney.com. "Gold traders are sitting on short positions (but) if the dollar comes down another notch or two, shorts in gold will start to panic. When gold starts moving, it (could) start moving very sharply (higher)." A weak dollar makes dollar-priced gold cheaper for non-U.S. investors. 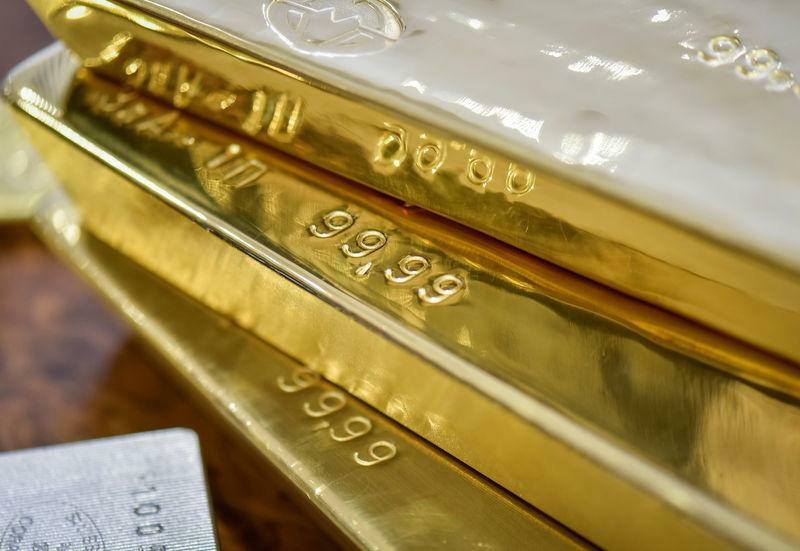 Investors have been buying the dollar and selling gold in recent months believing the United States has less to lose from a trade dispute than China. But they may be losing faith in the ability of the U.S. economy to withstand a full-blown trade war with China. A new Reuters poll showed unanimous agreement that a trade war with China was bad economic policy for the United States, predicting U.S. growth would slow to 2.0 percent in the fourth quarter, less than half the last reported rate of 4.2 percent. "If that trade war actually drags out, you could see worries in the markets. That typically drives investors to precious metals," said Chris Gaffney, president of world markets at TIAA Bank. "Also, it’s inflationary. With additional and extended tariffs, prices to consumers rise, because the tariffs get passed along. That is also supporting precious metals. Spot silver increased 0.5 percent to $14.27 an ounce, after touching two-week highs at $14.35. Palladium climbed 1.4 percent to $1,048.49 per ounce after earlier hitting a fresh five-month high of $1,054.80. Platinum gained 1.4 percent at $832.70 per ounce, after hitting its highest since July 10 at $834.60. India has trumped both the USA and China. Should you buy the Mahindra XUV300 petrol?